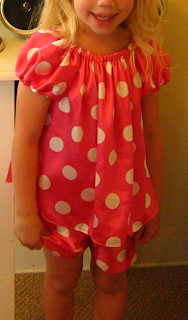 shellys sewing shrapnel: Pj's designed by my "little"
my little 4yr old was shopping with me in the fabric shop and saw pink silky fabric with large white dots similar to what is on Minnie Mouses dress and asked if she could have some "pink minnie jammies"? how can you resist that? When we got home she proceeded to tell me how the jammies should fit, where to cut, hot short for the shorts, and oh, don't forget the princess sleeves mom! I believe that smile says it all! So cute. You just cannot go wrong with polka dots and Minnie!